Sample front (above), Sample back (below). 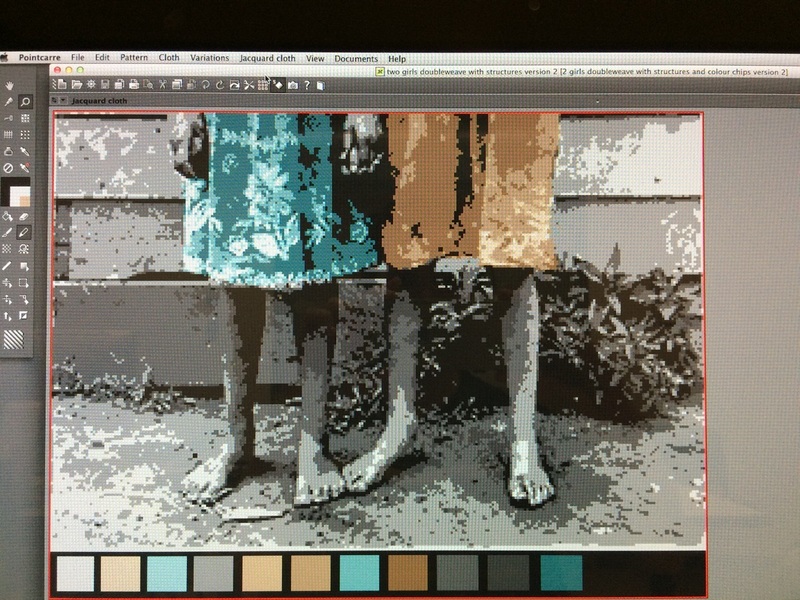 The original image (photo credit: Chris Jordan) this sample was interpreting can be found ﻿here﻿. 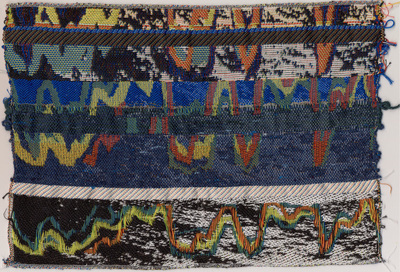 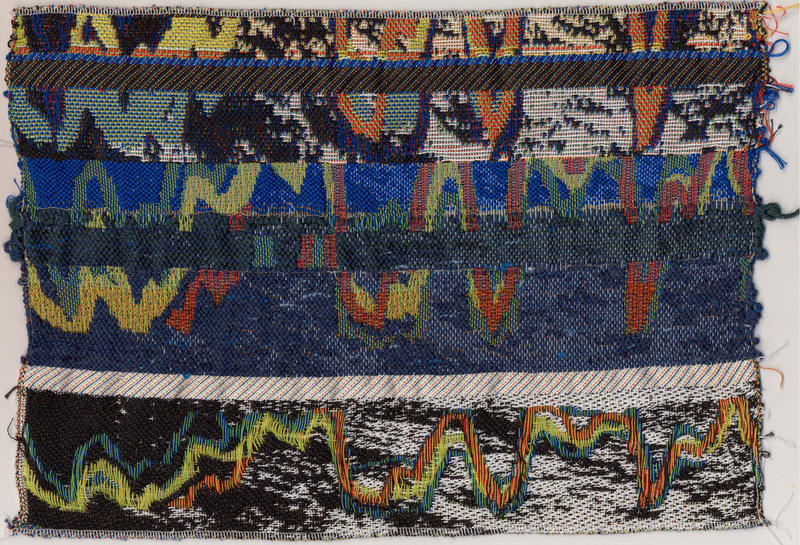 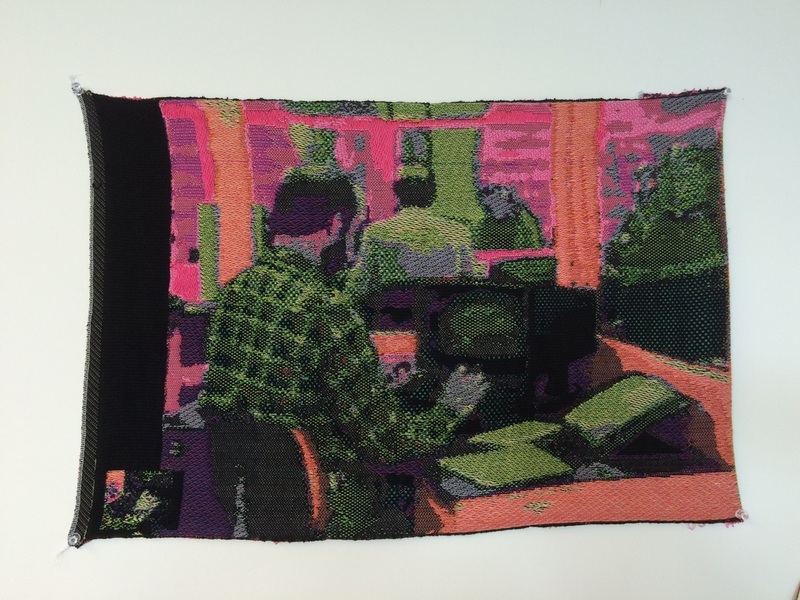 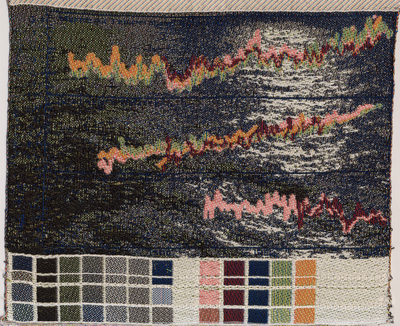 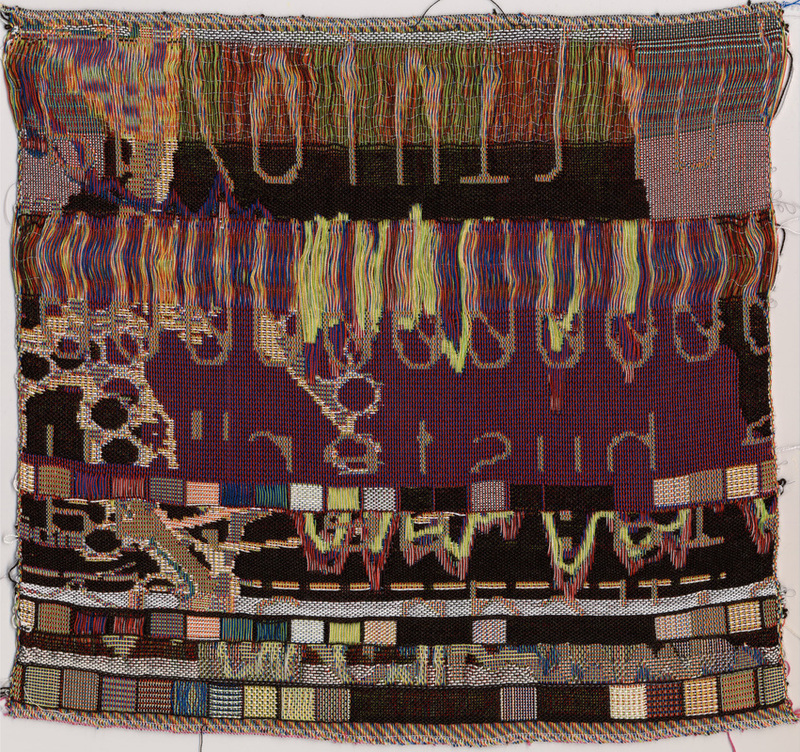 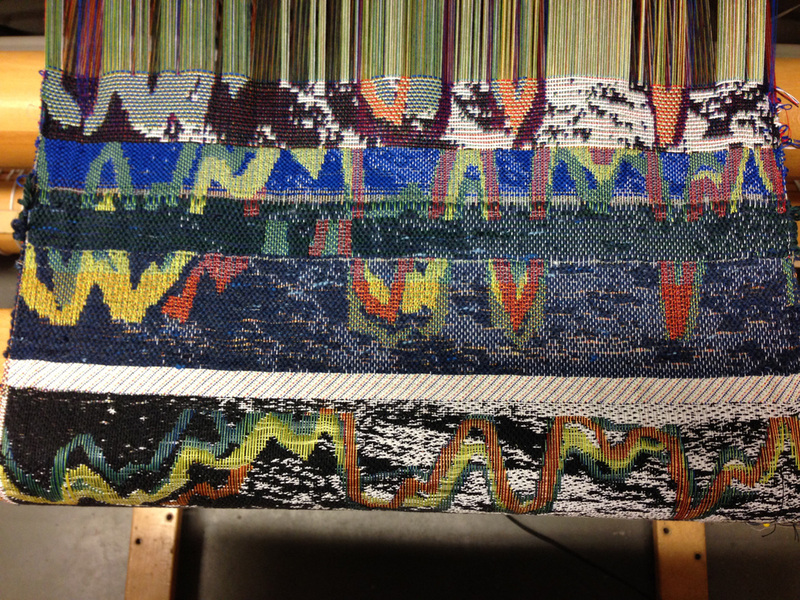 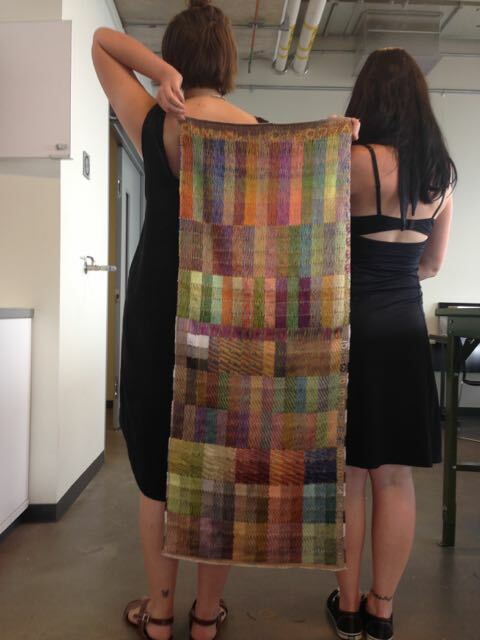 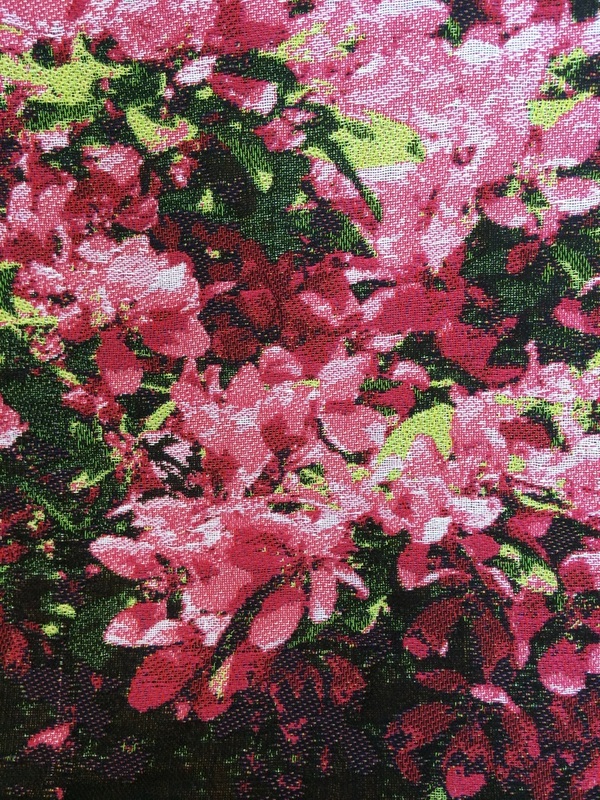 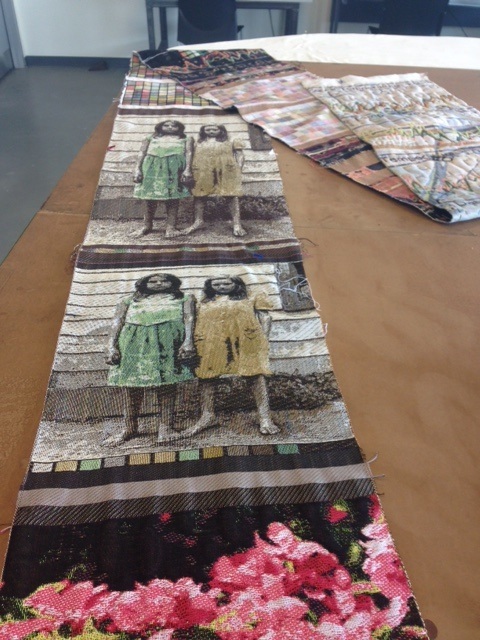 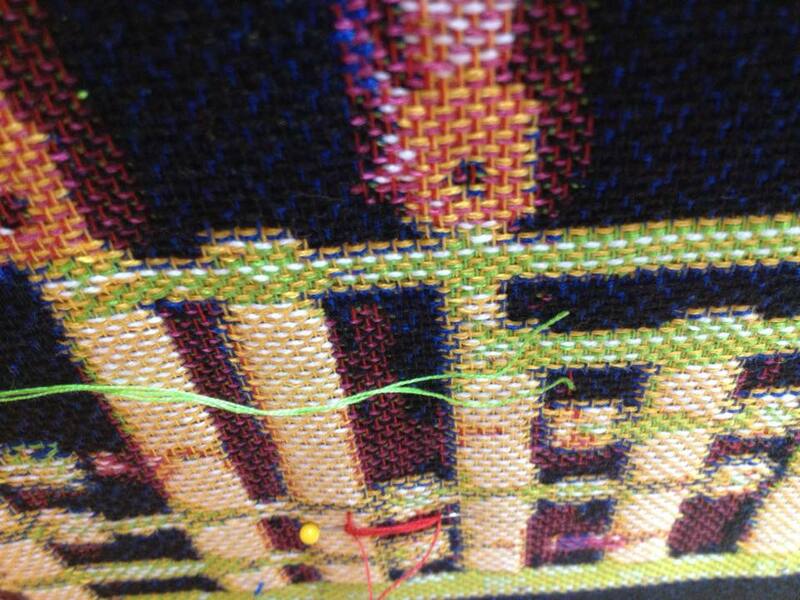 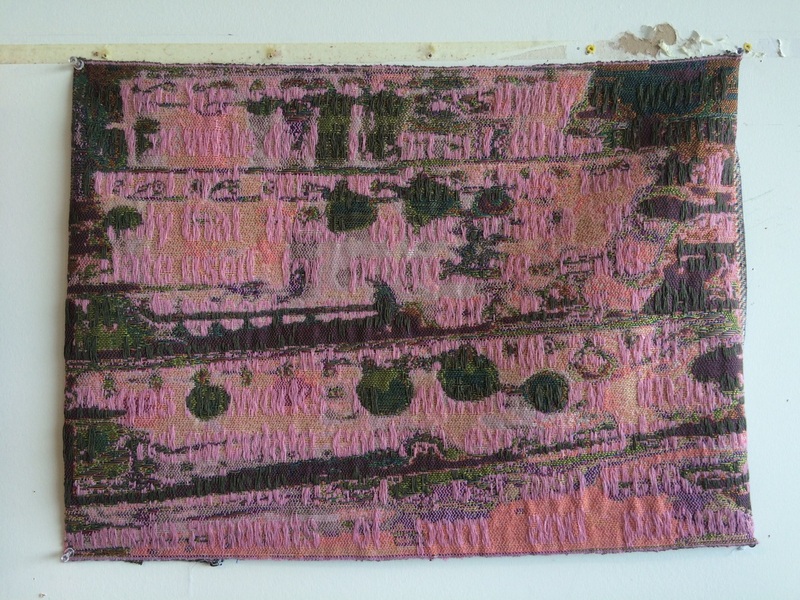 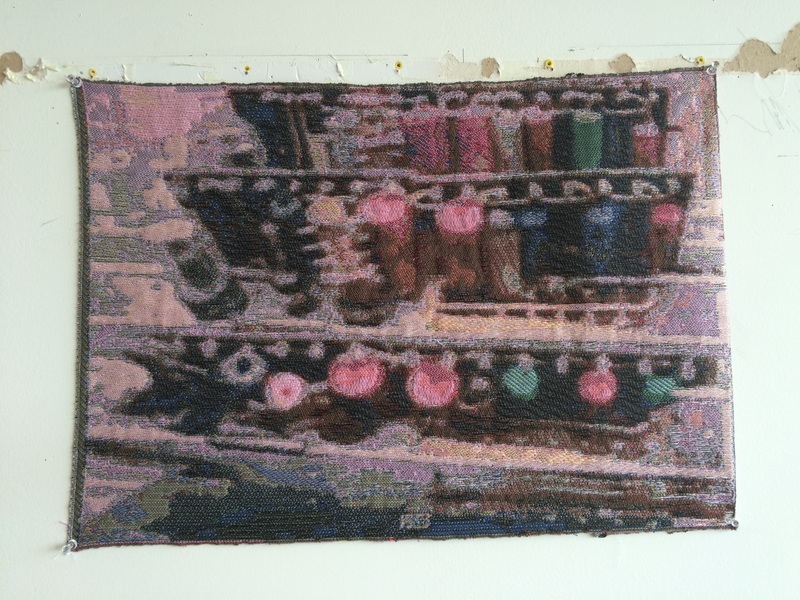 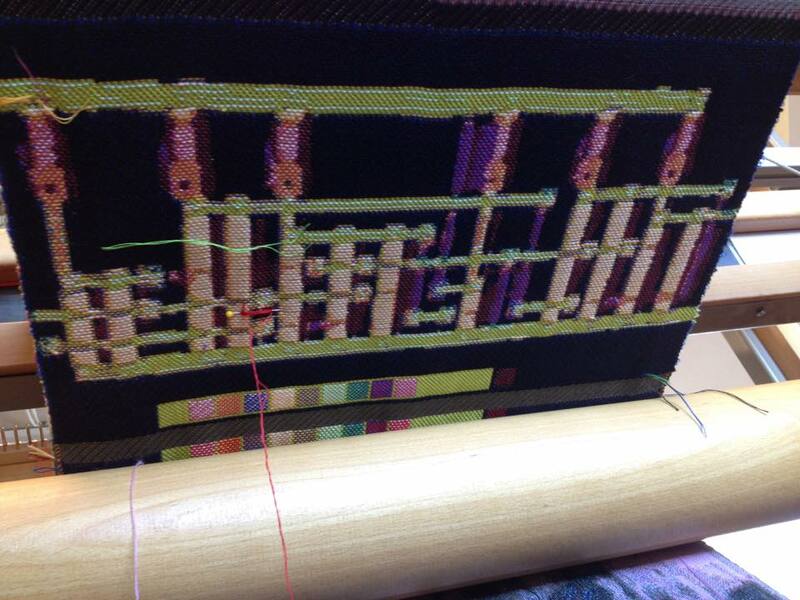 The summer 2015 Jacquard workshop series has concluded. 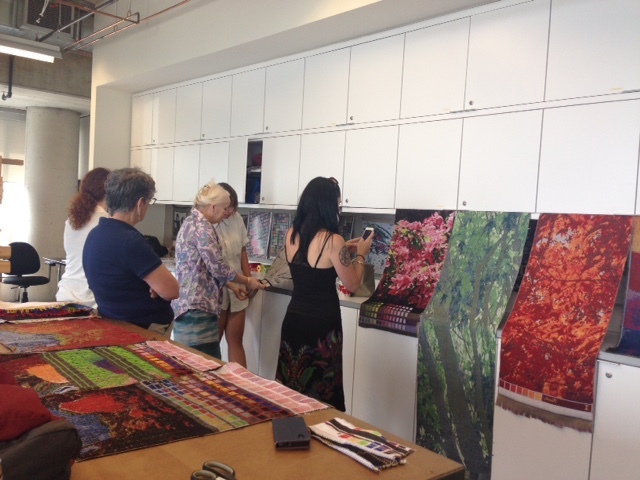 Special thanks to our teacher, Louise Lemieux-Bérubé, who shared so many new Pointcarré design skills with us. 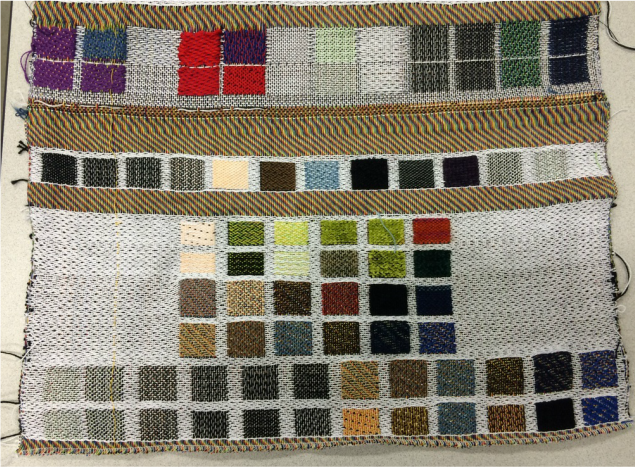 We are all so grateful to have had this opportunity, offered as part of the Material Codes: Ephemeral Traces project, funded by the FRQSC. 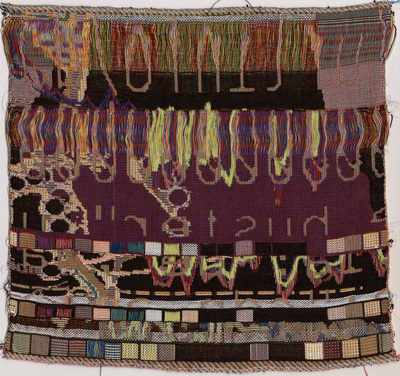 Samples shown hanging from the cupboards (above) by Claire Nadon, as well as some of her early experiments on the table. 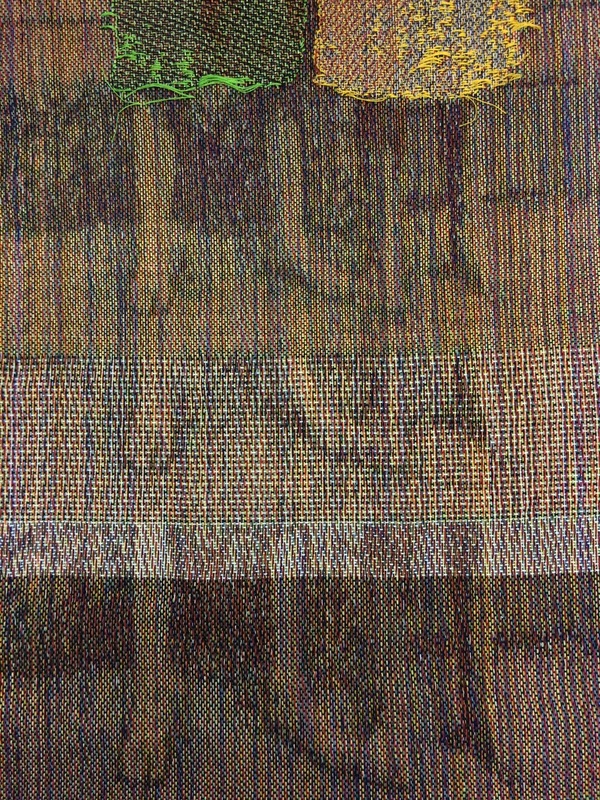 Some of the most recent weavings cut off the loom, just before the final workshop. 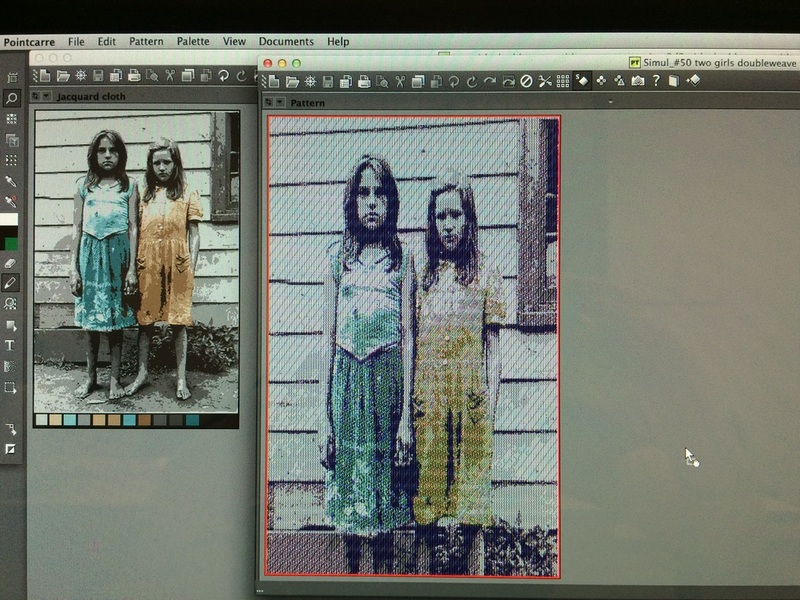 Image of two girls by WhiteFeather, floral image by Claire Nadon. 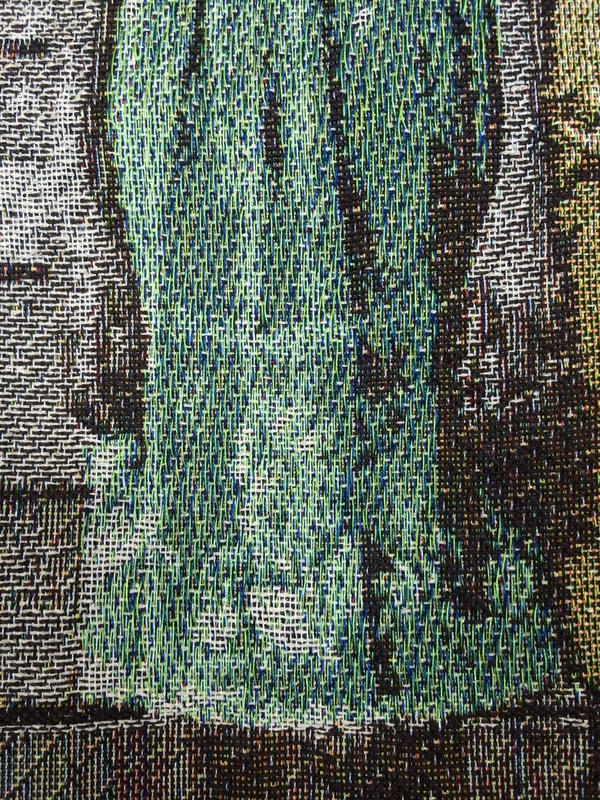 Detail shots from WhiteFeather's two girls (above). 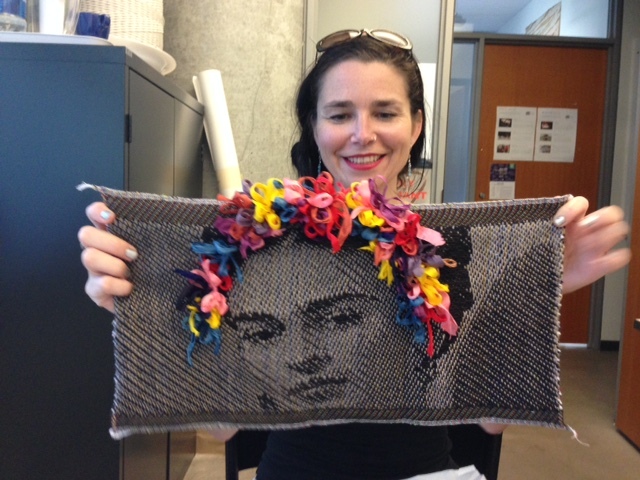 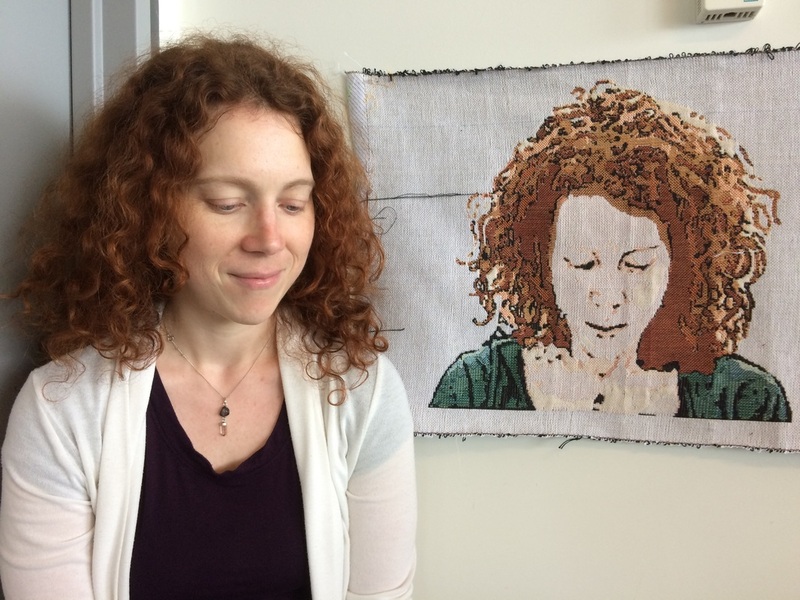 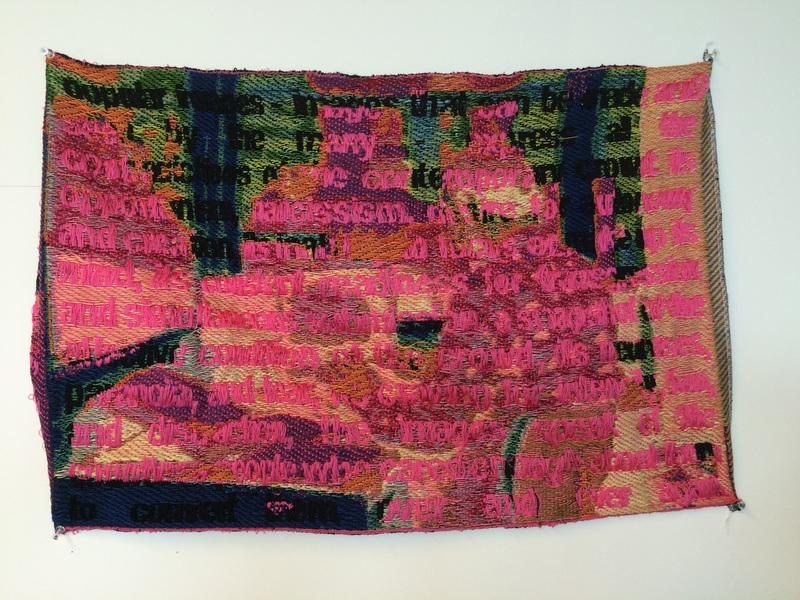 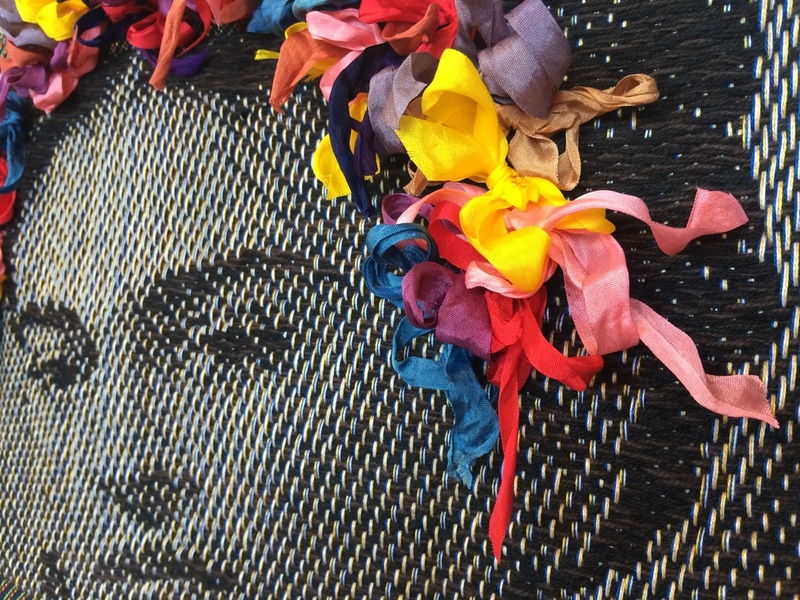 Geneviève Moisan with her self-portrait woven with industrial weave structures (above). 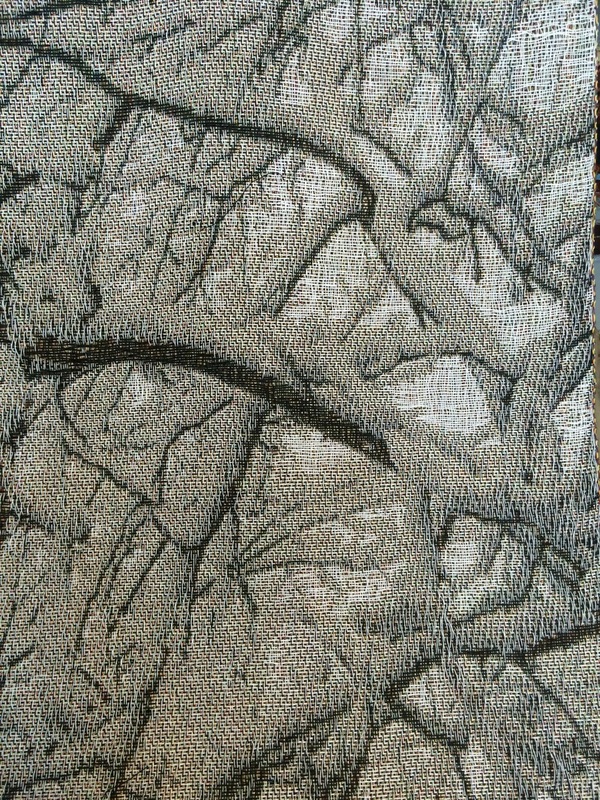 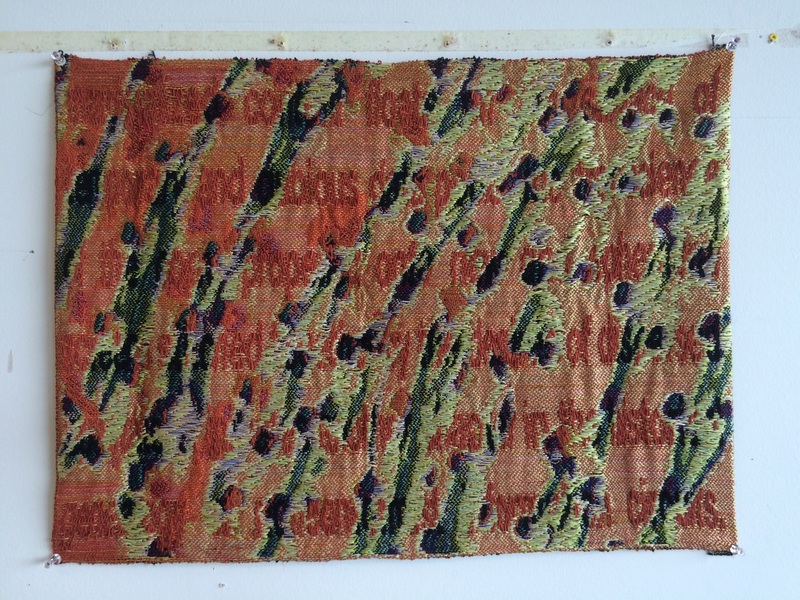 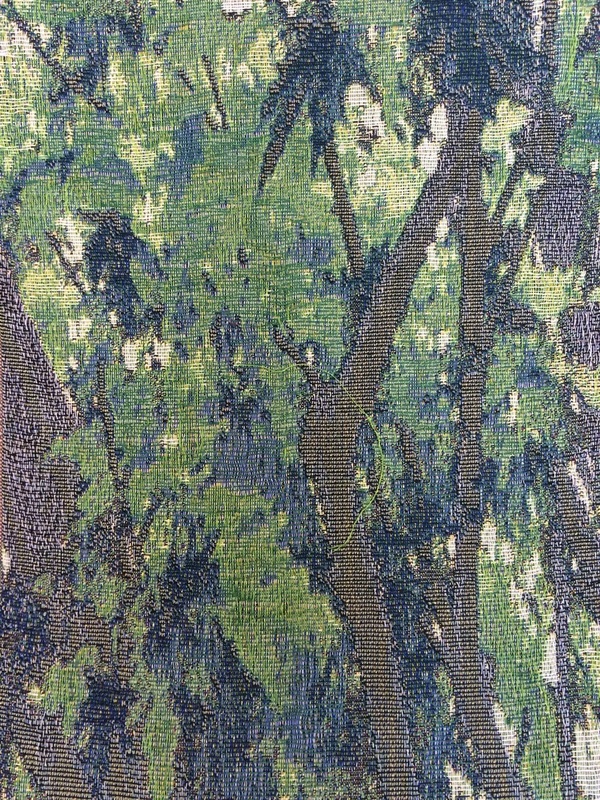 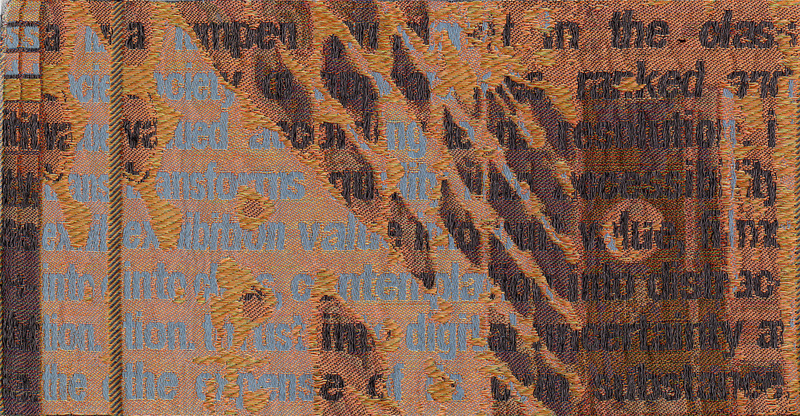 Gen's sample with brocade and industrial weave structures (below). 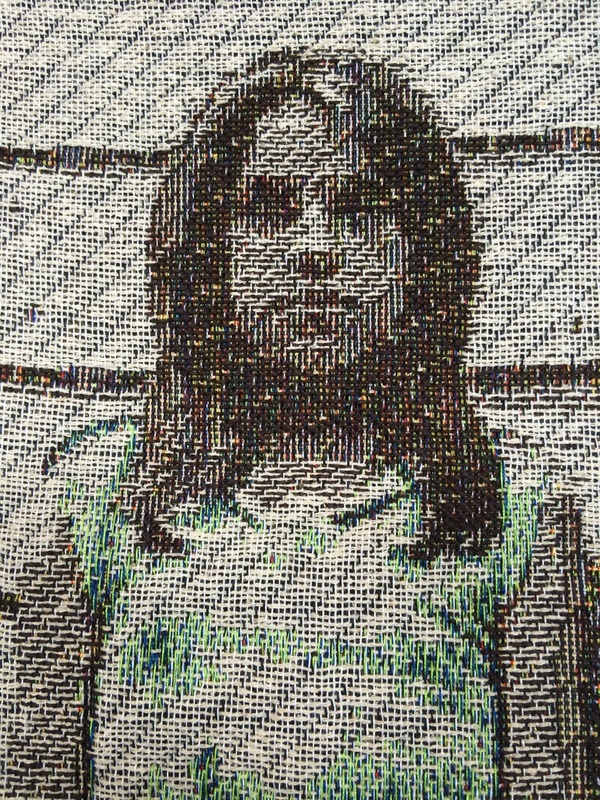 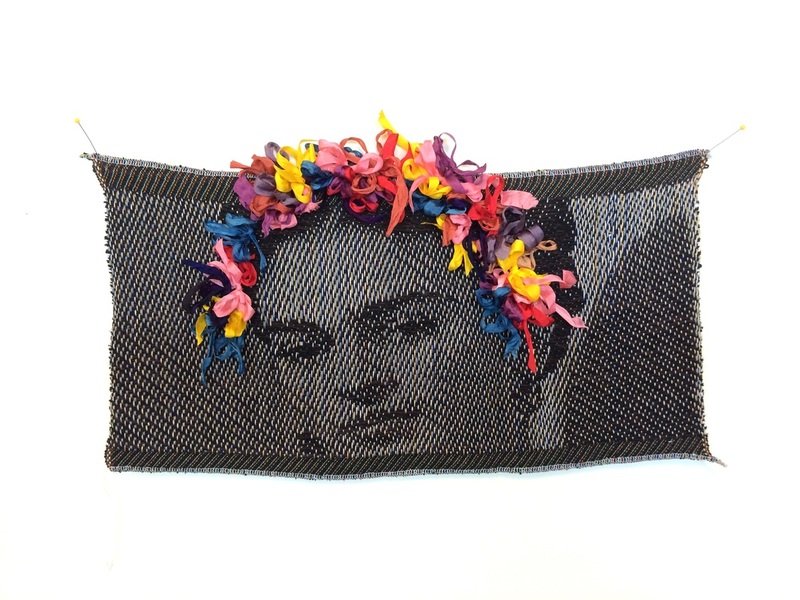 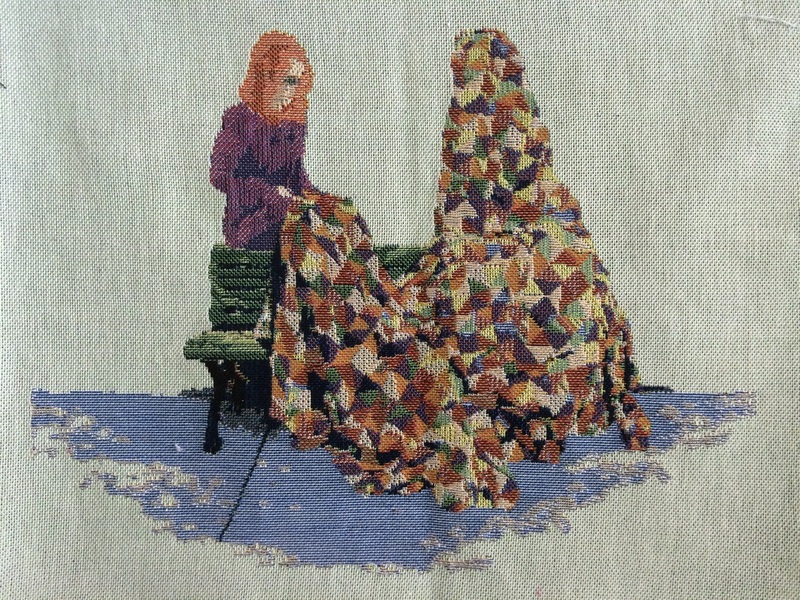 Another sample, and self-portrait, by Geneviève Moisan (below) using industrial weave structures. 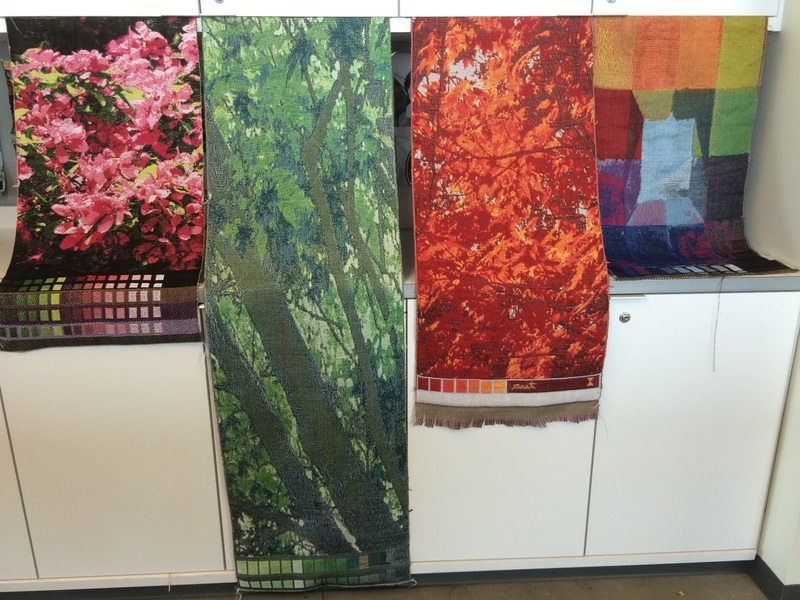 Below are some detail shots of Four Seasons by Claire Nadon (Spring, Summer, Fall and Winter) - based on scenes of trees in her yard through the same window during different times of the year. 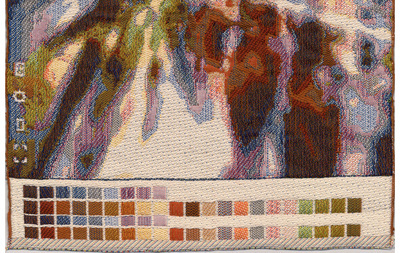 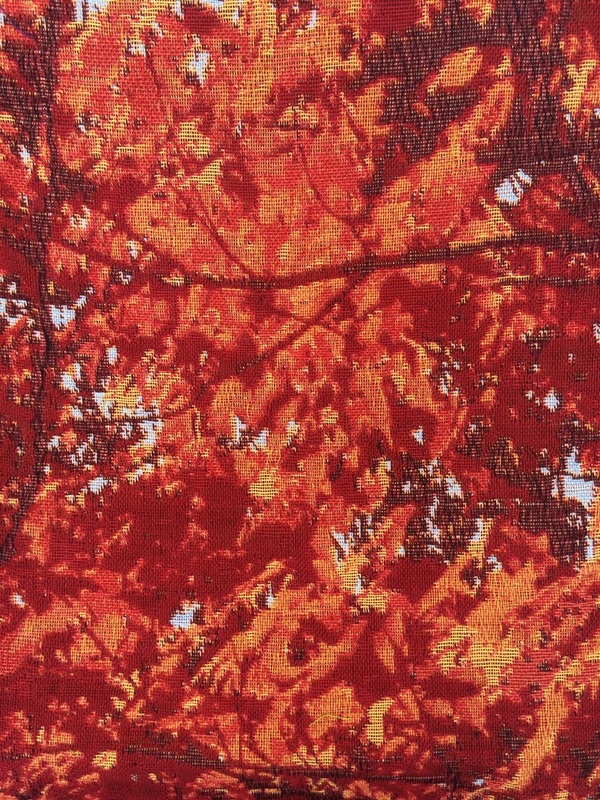 The image below shows three of the seasons together, as well as one sample (far right) based on an abstract painting. 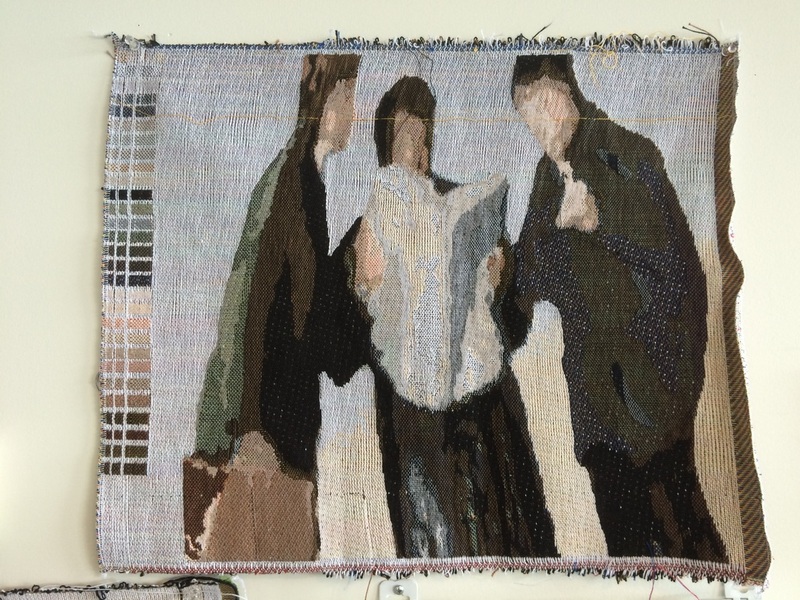 All by Claire Nadon. 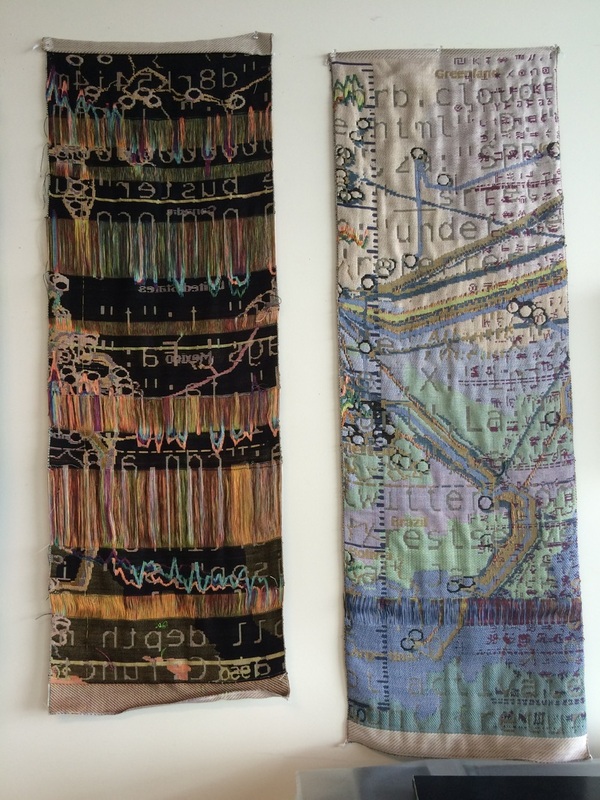 Below, a series of double-sided pieces by Sophia Borowska (front and back shown) - these are three new pieces in a series of five. 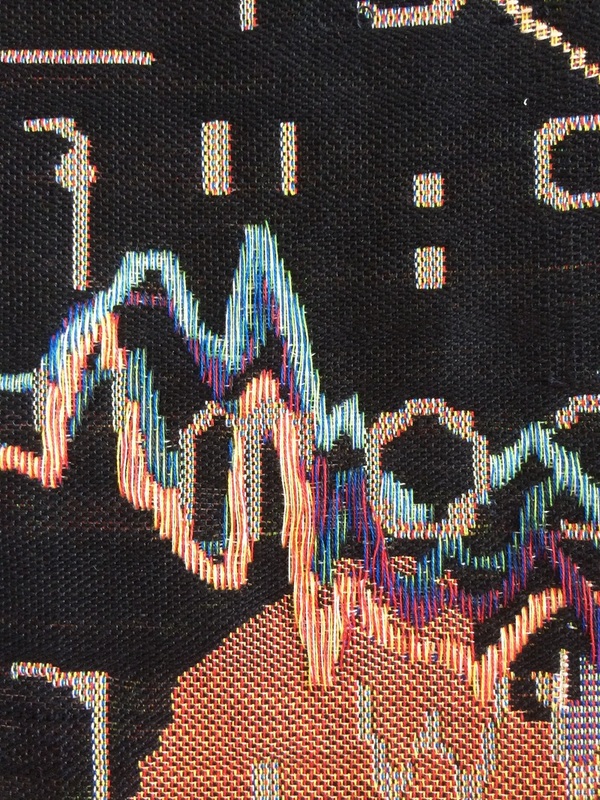 Finally, below are some samples in a new series on data by Kelly Thompson. 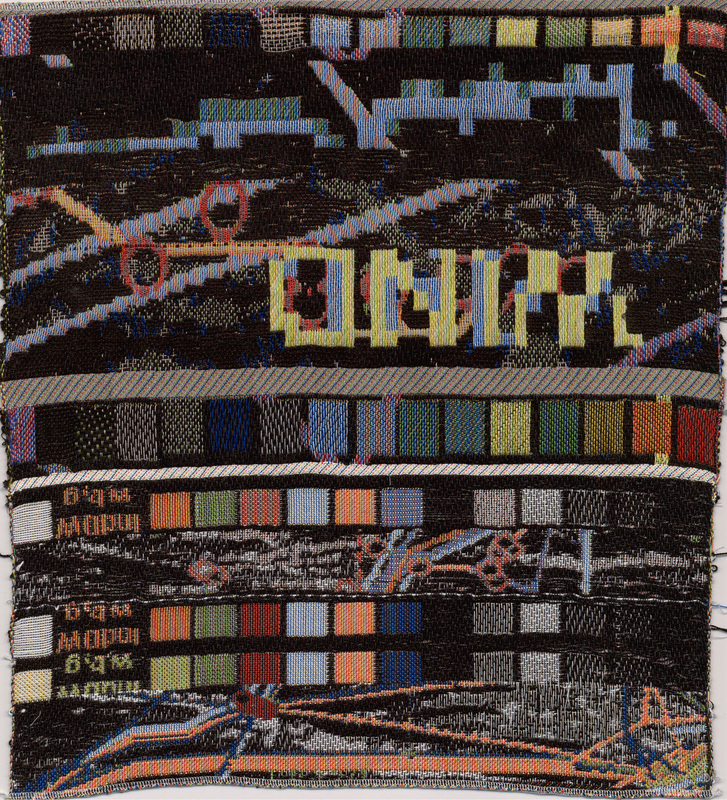 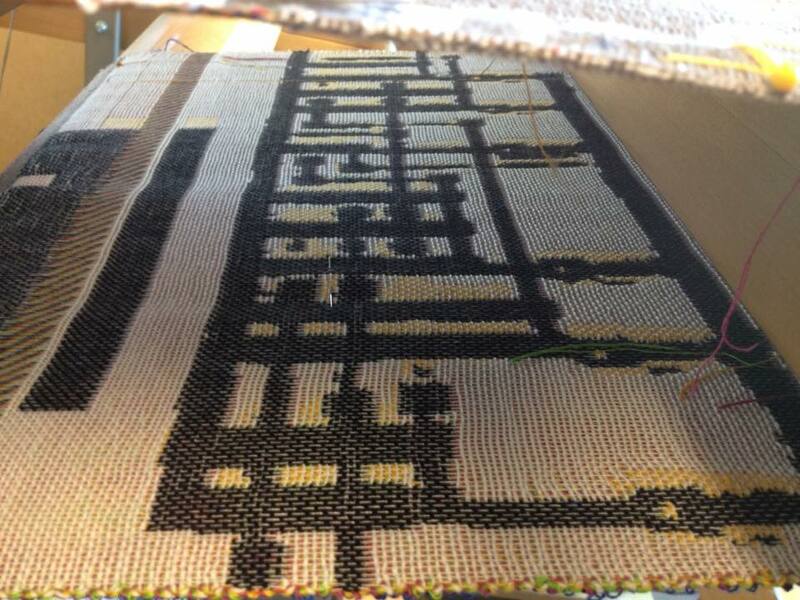 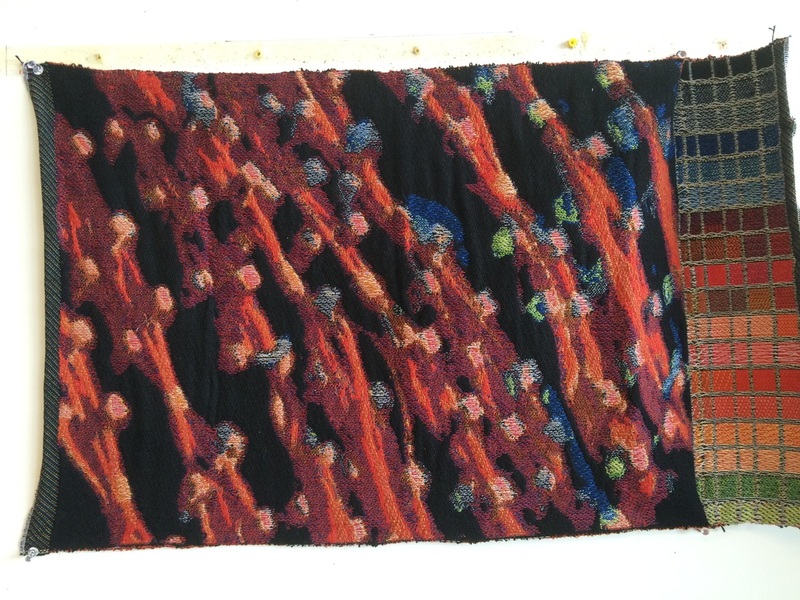 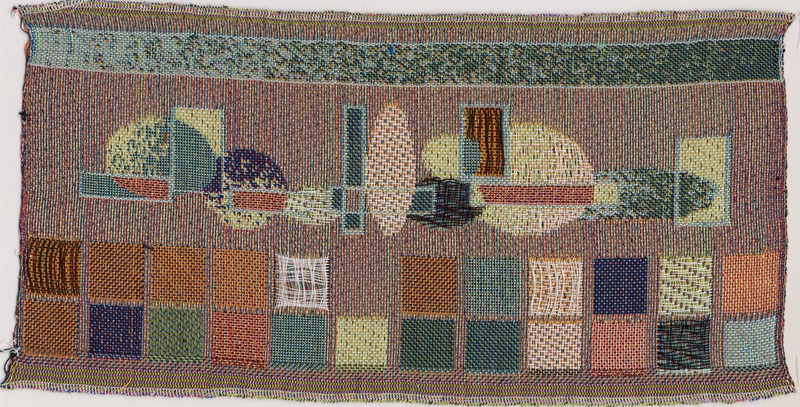 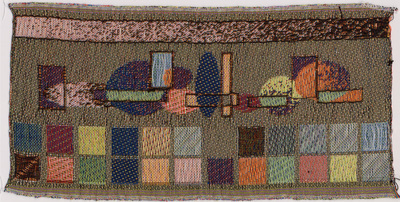 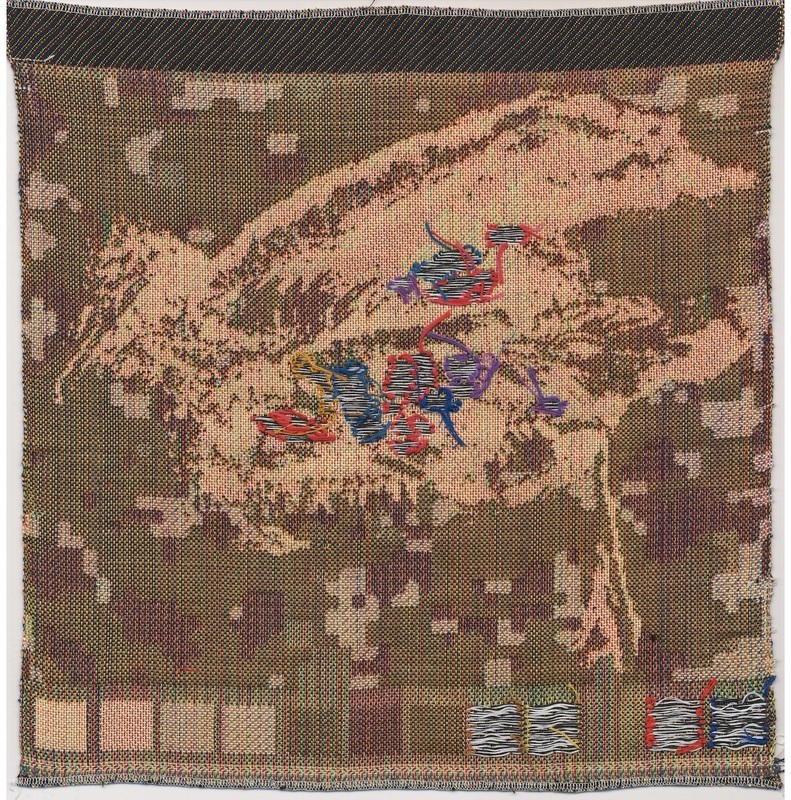 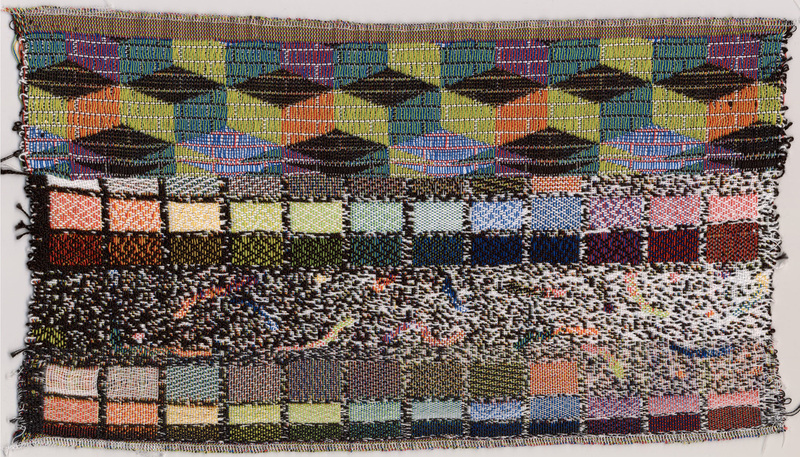 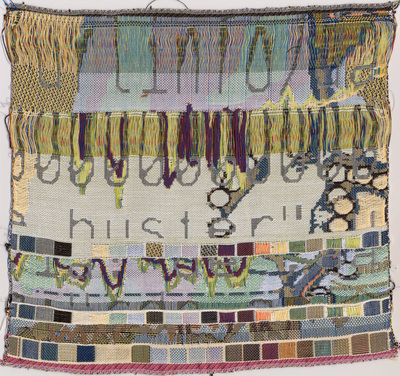 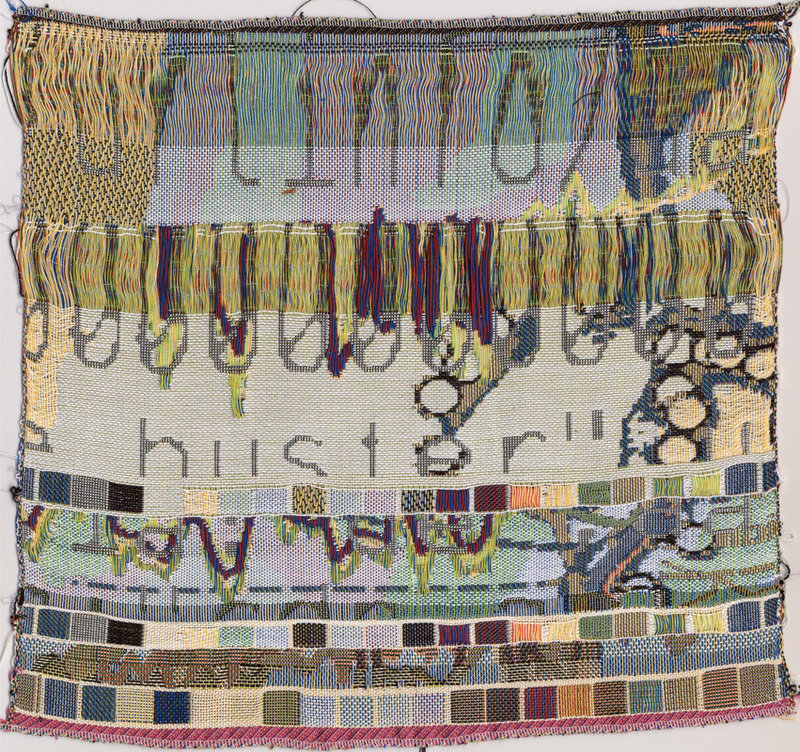 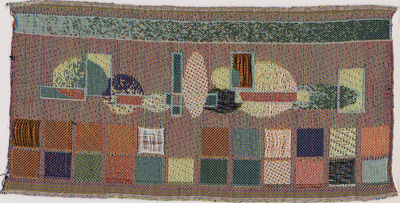 Above: image on the left shows the backside of one of the weavings, while image on the right shows the front side of another. 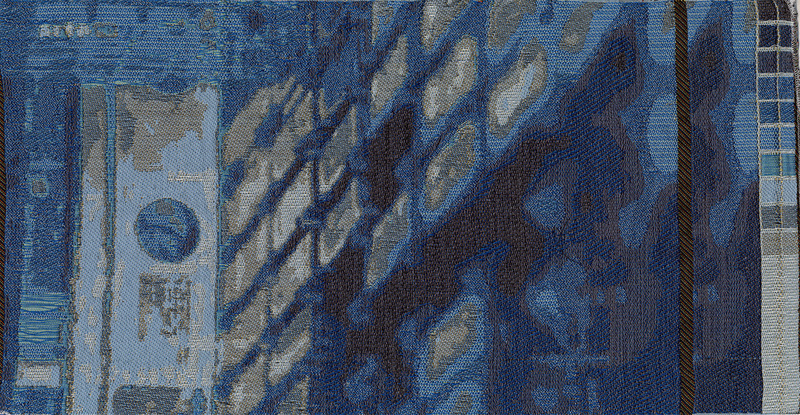 Combination of double weave structures, industrial structures and non-woven areas. 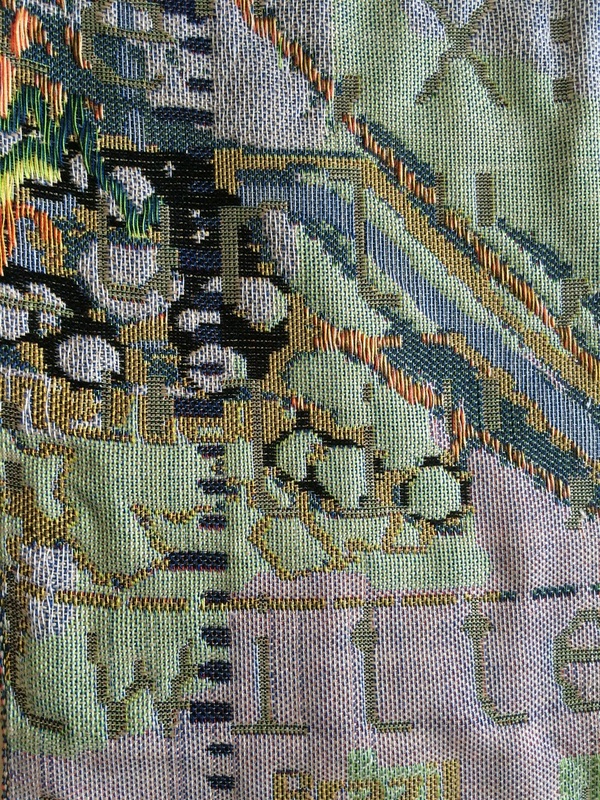 Below: detail of front of one of the samples in image on left, detail of back of one sample in image on right. 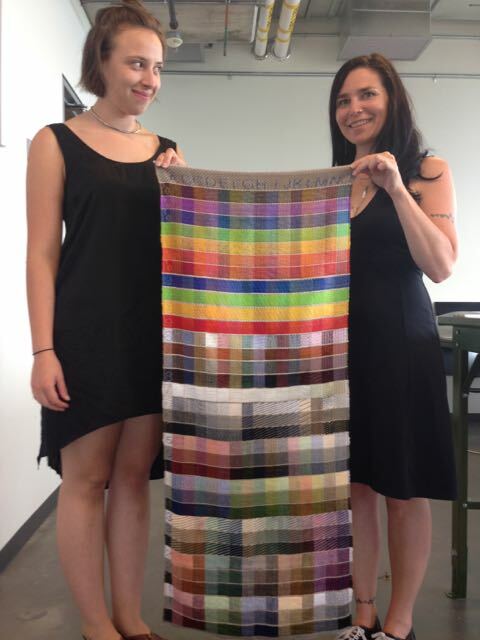 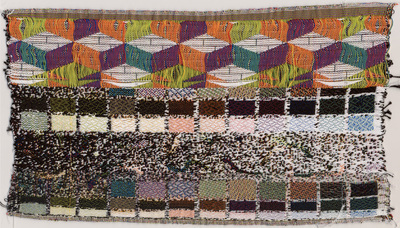 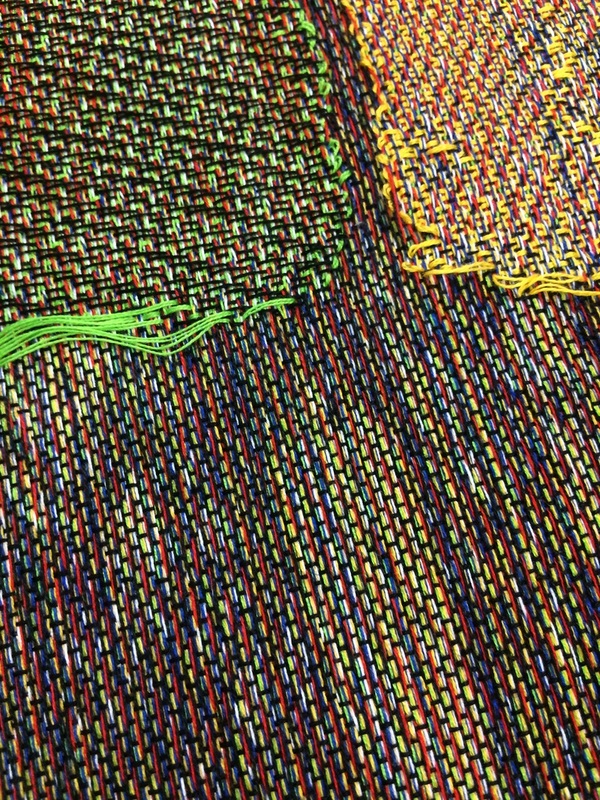 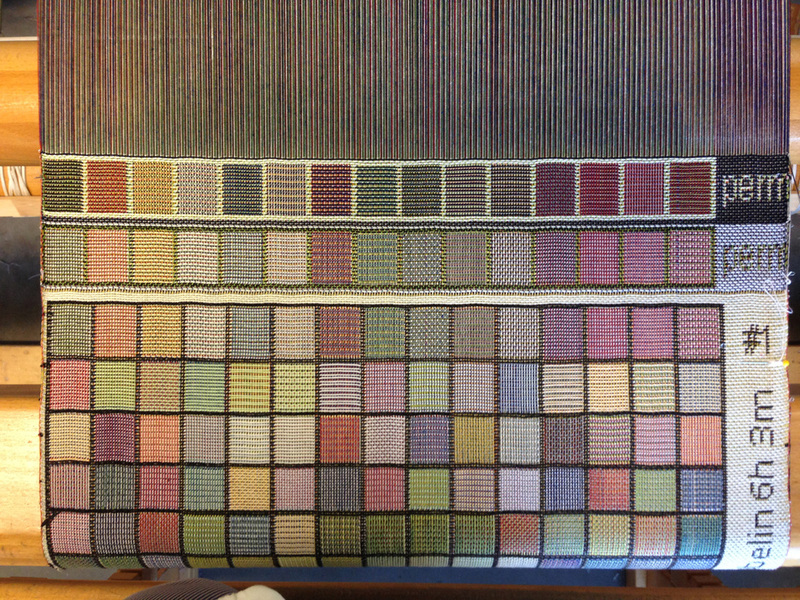 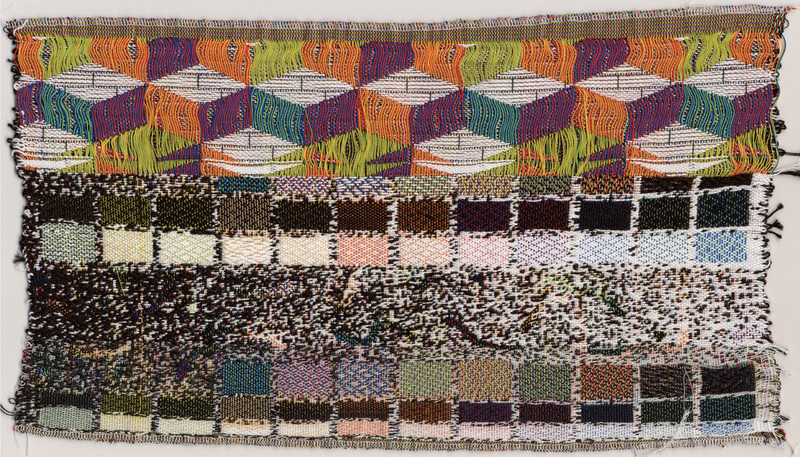 Let's not forget the colour chip samples woven by Sophia Borowska (and held up front and back here by Sophia and WhiteFeather). 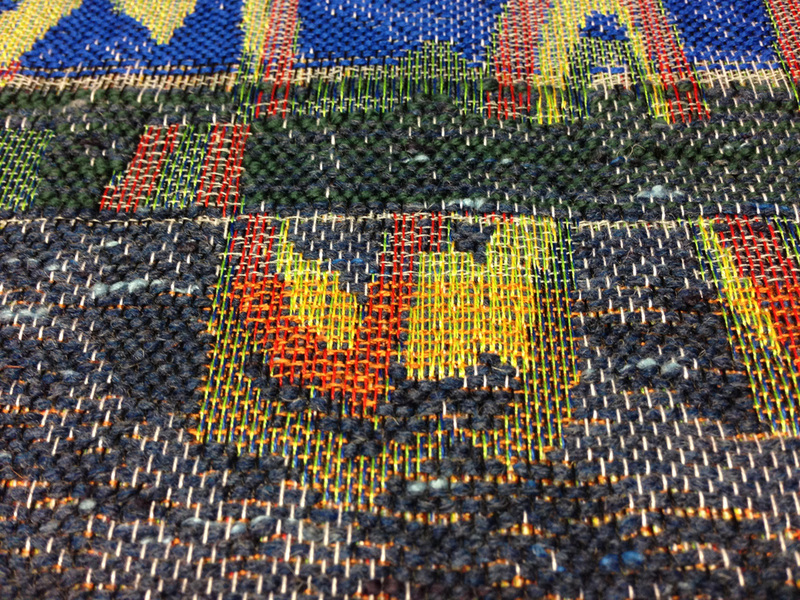 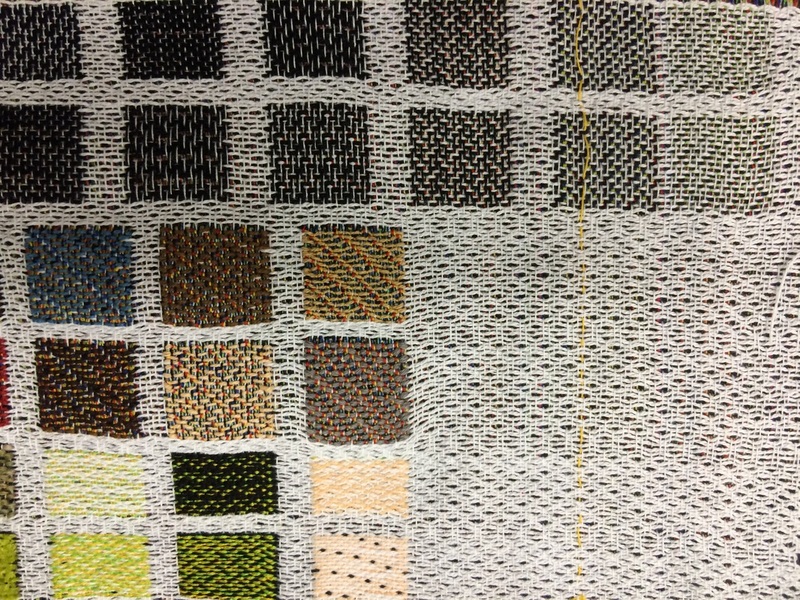 Tests in double weaves, using a different ratio of weft yarns in different structures. 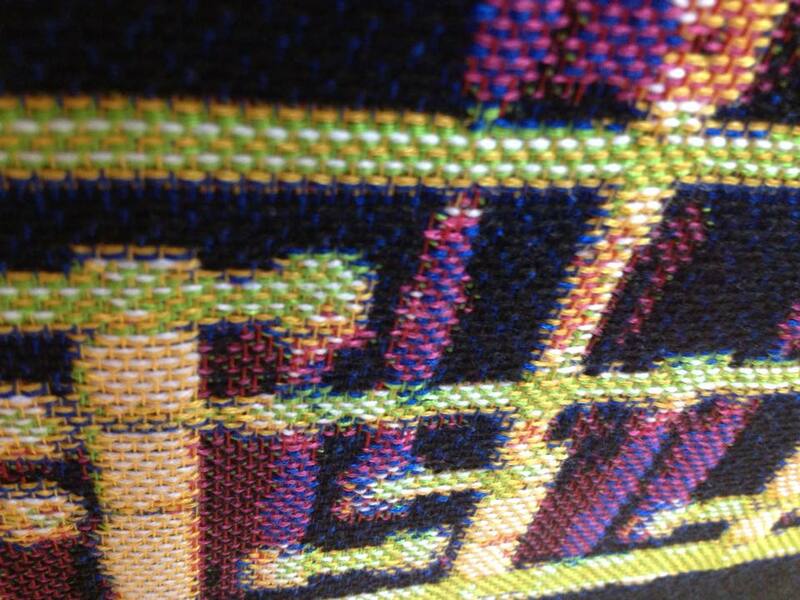 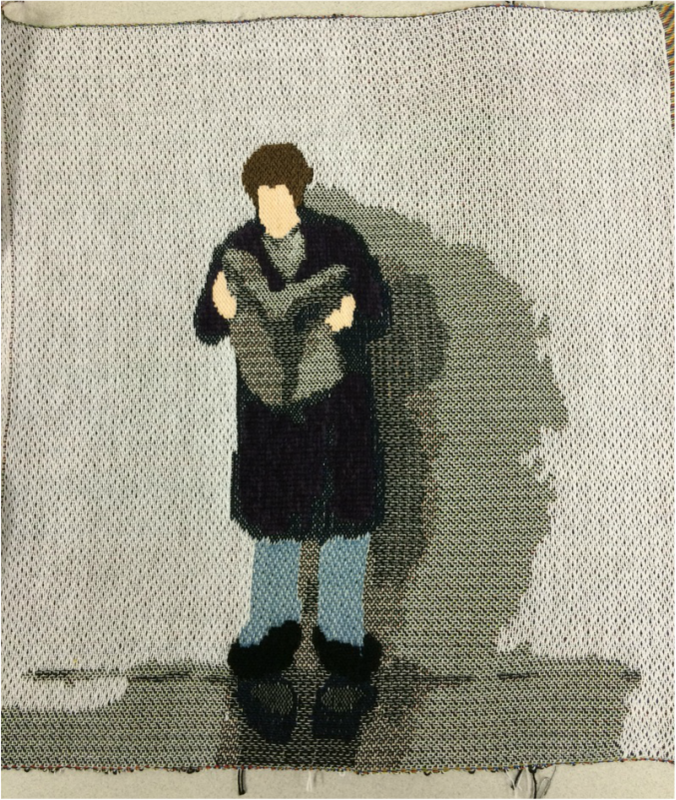 Still on the loom. 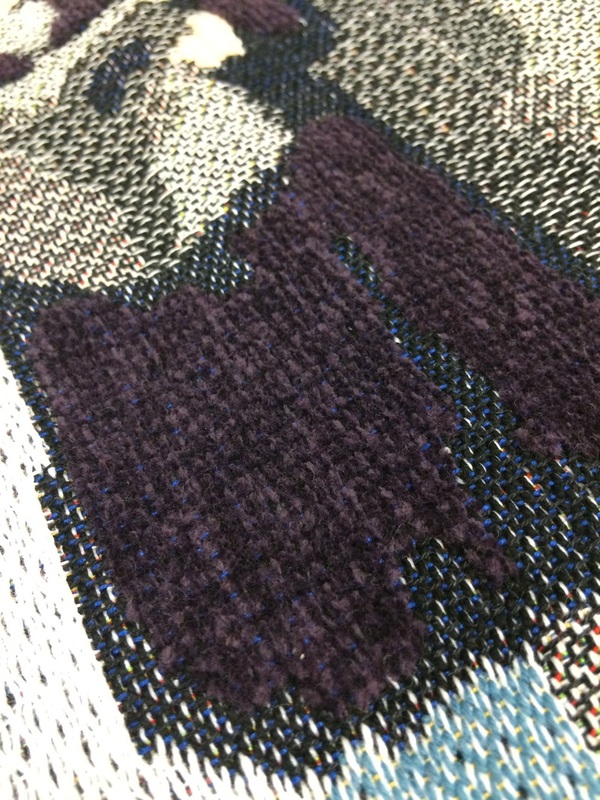 Double-weave using two wefts, one 2/8 cotton in light blue, one a mix of grey and black 2/16 cottons.